Every Service day, U-Build gathers members of YBB, a project sponsor and a community partner for a one day service event to encourage volunteers to make a positive impact in the neighborhood. As every year, volunteers from BCBS lent a helping hand to nonprofit partners across the region to address critical community development needs focused on healthy living. 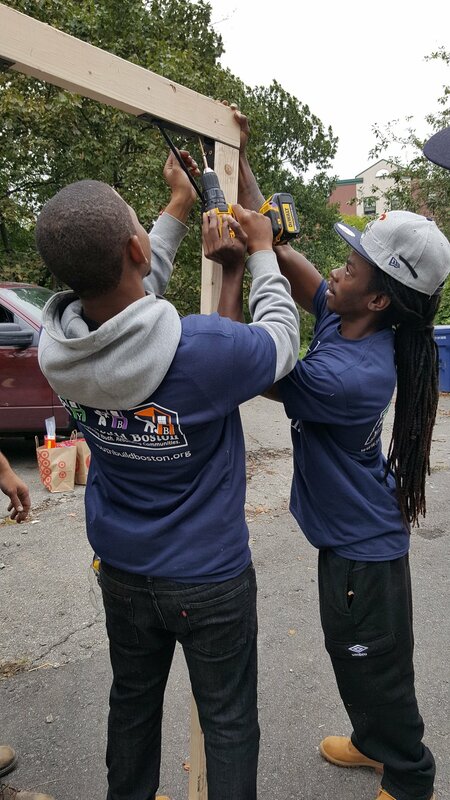 For over ten years, BCBS has been a steady back bone in our ventures and has constantly been on board with the Youth Build Boston family. This service day, we decided to work with Paige Academy and with the members of BSBC. Paige Academy offers a far reaching educational environment for children of ages 6-12. The prep school has been a long standing partner of Youth Build and has been a reliable project sponsor to our organization for over the last few years. On the 28th of September 2016, over 60 volunteers from BCBS and the staff of YBB pronounced to fix a few teetering structures on the grounds of Paige Academy, located on 28 Highland Avenue, Boston. The volunteers of BCBS, led by the staff and students from YBB helped through with tweaking structures and light carpentry work. A few hours through the day, and the grounds of Paige Academy were massed with an enthusiastic work force getting their elbow grease on! The teams worked through with a smile on their face, as their got through their assigned tasks like clockwork – The zeal and passion with which the teams worked was indeed noteworthy! Soon enough, the teams produced a brand new bridge over the schools Koi pond, a remodeled chicken coop, bright new playhouses for the children at Paige academy, new compost sifters and bundles of compost bags were packed and sealed for community purchase, a decaying retaining wall was repointed and the teams even planted festive fall flowers all along the site! A feeling of accomplishment swept over all the volunteers, as Paige academy looked as good as new after it’s much needed remodeling. As the day winded towards a momentous end, Ken Smith, the executive director of Youth Build gave out his message of appreciation and his sincere thanks to the volunteers of BCBS and Paige academy. Once again, we would like to thank everyone who contributed to our community project and making it a successful venture!